Banker is just one of the 200 jobs available at Wannado City, an unusual role-playing theme park in Florida where children learn about the world of work. 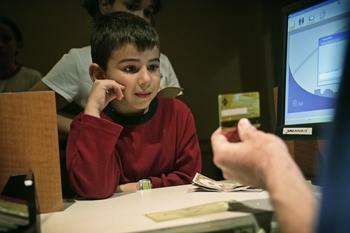 Aren Pattoukia (age five) hands the bank cashier a freshly printed cheque. How would he like his money? “Half in large notes and the rest in cash,” he replies confidently. For one entire day Aren Pattoukia, a shy little boy, is a citizen of Wannado City. Wannado City is a theme park the size of three football fields built in the middle of Sawgrass Mills, a shopping centre complex in Fort Lauderdale, Florida. It is a kid-sized replica of a real city and the little ones behave like adults here. Laresgoiti’s business started in Sante Fe, just outside of Mexico City. In 1999, with the help of investors, he opened La Ciudad de los Niños where children learn the complexities of the adult world in a playful manner. The park was a hit and visited yearly by over a million children. As a result Laresgoiti wanted to expand, but his partner didn’t agree, so he moved to Florida. With 40 million dollars from the Mexican entertainment conglomerate CIE, Laresgoiti developed Wannado City in Fort Lauderdale. The amusement park which opened in August 2004 with 14,000 square metres of space in a former supermarket is the first of 10 children’s cities planned for the USA. He also plans to expand to Asia and Saudi Arabia. The visitor numbers in Ft. Lauderdale are immense. The kids stand in a queue in front of the bank. If you want to work as a policeman you have to wait half an hour, while the fire department has an employment freeze. Laresgoiti calculates he had 900,000 visitors in the first year, circa 2,500 daily. Children pay $30 and adults $15 entrance fee. Within two-and-a-half years the investment will be paid off. He doesn’t see Wannado City as a playground, but as an imitation of the world. So he takes great care over the details, from the kid-sized but real tools to the exact replicas of work uniforms. Even the fire department’s water hoses shoot real water. In addition, 12 sponsors and their logos give the children’s work the stamp of reality. The newspaper that the little reporters research for is called the Miami Herald, Florida’s largest newspaper. Working as a cashier you are employed at Publix, a supermarket chain with over 850 stores in America’s south. On its shelves you can find ketchup from Heinz and pasta from Barilla. The money that the kidizens (junior citizens) accrue is managed at the State Farm Bank, an American financial firm that offers insurance and bank services. ‘Watch how your Wongas grow,’ exclaims the bank slogan. Tiny paramedics bring accident victims to Plantation General Hospital, a private hospital in the Ft. Lauderdale region. A dozen flight simulators stand in the hull of a scrapped DC 9 from the airline Spirit. Soon Coca-Cola will be opening the local bottling plant. Eight-year-old Sydney stretches her left arm out horizontally. A studio camera catches her somewhat stiff movement. “It is sunny and 21 degrees Celsius in the north of Wannado City”, says the second-grader. She’s wearing a jacket with big red letters on the breast pocket reading CNN. Sydney is reading the weather forecast at the American news station, one of the sponsors of Wannado City. Her classmate Sarah is reading the news, together with her dainty four- year-old sister Andy. Swinging from their necks are press passes with CNN logos. After Sydney’s weather report Sarah says goodbye to the audience. A few minutes later the edited broadcast plays on the monitor. “Where will it be shown?” the proud young journalists would like to know. Nowhere, but the broadcast can be bought as a DVD for $10. The same repeats itself at the pizzeria, where the kids put on their chef’s hats, bake a pizza – and then have to purchase their lunch. In the gift shop at the exit, the kids clamour to buy the tools and uniforms they used in the city. The parents have to pay all this with hard dollars, not soft Wongas. That doesn’t bother Judy Odsess. The mother of the two newscasters praises the “high educational value” of the theme park. “My daughters are learning that you first have to earn money before you can spend it.” And when they do spend their Wongas there’s a circus show to visit, or a theatre showing – with no discernible irony – Peter Pan, a play that advises children not to grow up. Hidden interests are discovered in Wannado City, says the mother. “Sarah didn’t know what she wanted to do, now she wants to go in to television.” The state of Florida agrees. Schools are sending entire classes on school trips to Wannado City with the blessings of the teachers and the parents. Judy Odsess also likes Wannado because it’s safe for her daughters. A security system inspired by the casino city Las Vegas takes care of total child protection. Sixty hidden cameras under the high black ceilings catch everything going on. Plain-clothes security guards wind through the streets of the artificial city unnoticed. At the entrance all visitors receive an electronic tracking bracelet linking all members in their party. A lost child or a vanished father can be located immediately with this tracking device. A group of visitors is only allowed to leave the park together. Margaret Marquez has brought thirty 10-year-old girls with her. Her daughter Bianca wanted to celebrate her birthday with a kidney operation. She and four friends put their light blue doctors’ scrubs on, wash their hands and pull on latex gloves. They follow Doctor Phillip Josaphat to the operating room, where lying under a green blanket is a realistic doll with dark hair. A monotone thumping interrupts the girls’ laughter. “That sound frightens me,” says Bianca whose braces glow in her mouth. “It’s the heartbeat of our patient Billy Bob, who suffers from kidney stones,” reassures Chief Doctor Josaphat, a 20-year-old biology student from Haiti who works at the theme park. The doctor guides the little surgeons over to the X-ray pictures and explains how calcium deposits build up kidney stones. “Now we have to cut Billy Bob open and remove the stone.” “So cool,” squeals one of the girls. 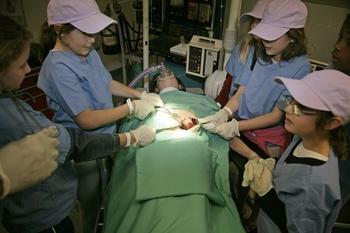 Bianca, the birthday girl, sterilises the abdominal wall while her friends dissect. Intestines peep forth. “Is everyone okay?” asks the doctor. One girl turns away, ghostly white. “I can’t watch anymore.” She leaves. “She’ll never become a doctor,” murmurs Bianca. The operation lasts 10 minutes. The patient survives. Each of the girls gets paid 40 Wongas for their work and then move on to the paediatrics department, where they will care for the newborns. As nurses they will change diapers and feed the babies. Before they finally leave the hospital, they visit the adoption office. Here they can buy realistic looking dolls – for real cash, not Wongas. In Wannado Ciy no one is unemployed. The choice of profession is free and the middle class is intact. Outsourcing doesn’t exist. Wannado City presents itself as a city without any ideology. As in real America, different ethnic groups mix in the workplace. ‘In Kids We Trust’ is the motto in the courtroom. Children’s heads, not presidents, adorn the bank notes. Only the American flag next to the judge, as well as a picture of George W Bush in the courtroom testify to everyday life. Wannado City has the feel of a big city as something is happening almost round the clock. At night though, when the children are sleeping, a more mature clientele amuses themselves here. The park is available for company events and then the adults get to act like kids. As a child, I would have loved this. As a parent with two grown sons, I’m glad their mother never saw anything like this while they were growing up. I don’t know if I’m carrying a double standard here or not? OMG! This was one of the best ideas ever!!! I just moved to Florida and my five year old had one of the best times ever! she was a Dentist, a Vet and I was amazed at what she learned and hot much fun she had. We need to have more of these educational places through the US, it was money well spent. The Costco deal $79 for one year was worth it too.